The upper eyelids greatly affect the overall appearance of the face. You may note by looking in the mirror that the eyelid skin plays a critical role when you are smiling, frowning, and making other everyday facial expressions. As one of the few plastic surgeons double board certified and performing only face procedures in the Atlanta area, Dr. Burke Robinson prides himself on his exceptional upper eyelid surgery results. “You look tired” or “Are you upset” are often heard by those suffering from droopy upper eyelids, bags or puffiness under the eyes. Hooding or drooping of the upper eyelids is often the first signs of facial aging. However, frequently young people in their 20’s and 30’s complain of this same hooding as it is also hereditary. On occasion, the upper lid skin excess causes problems with vision, and in this case, the blepharoplasty may be considered functional as well as cosmetic. Insurance companies require a general eye exam and visual fields tests; as well as, pre-certification prior to surgery. However, depending on your face and desired results, a browlift, lower eyelid surgery, or combination of procedures may be the best option. Dr. Burke Robinson can develop a surgical plan for your face at a private consultation. For more information on upper eyelid surgery, contact our offices serving Duluth, Atlanta, and other Georgia areas or read our eyelid surgery frequently asked questions. Patients are under anesthesia during the entire upper eyelid surgery procedure. Dr. Burke Robinson makes incisions following the natural creases of the upper eyelids and, through these incisions, carefully removes excess fat, muscle, and skin as necessary. Extremely fine sutures are used to close the incisions. The eyes will be lubricated after the procedure to help the patient heal quickly. The entire procedure takes less than an hour to perform and patients experience minimal discomfort and downtime. “The incisions are hidden in the natural crease of the upper lid. The patient can return to work in just a few days and no one really knows why they look so rested and radiant”, Dr. Robinson says. Because of the contrast between the dramatic improvement in patients’ appearance and the short downtime associated with the procedure, it is a popular and common cosmetic treatment. Dr. Robinson explains why patients choose upper eyelid surgery to remove excess skin & reduce puffiness for permanent, dramatically rejuvenating results. Recovery from upper eyelid surgery is relatively simple, says Dr. Burke Robinson. “Patients typically take medication for one day, and the stitches come out one week later.” Upper eyelid surgery patients are typically able to read or watch television within a few days of surgery. Dr. Robinson monitors each patient’s progress to ensure that the incisions are healing normally. Within a week, most people are able to return to work and go out in public. At this time, patients may wish to use makeup to hide any remaining signs of surgery. 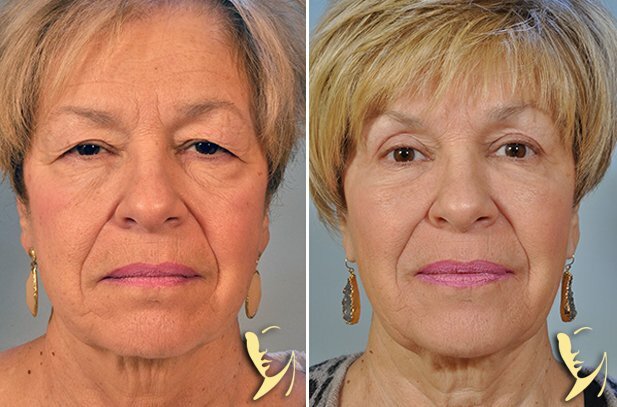 Upper eyelid surgery is an extremely rewarding procedure for patients because it creates a refreshed, younger look without the long recovery times associated with more invasive plastic surgery. With two convenient office locations, one in Alpharetta and one in Dunwoody, our RFPS team serves patients throughout the metro Atlanta area. Dr. Robinson performs all his surgeries at fully-accredited facilities scheduling at either Northside Alpharetta Surgery Center or Atlanta Outpatient Surgery Center.